Online video — helped along by the rise of tablets, better broadband and a flood of content from YouTube, Netflix, Amazon and many others — has seen a huge rise in usage in the last few years; and while PCs remain the most common way to consume it, thanks to consoles like the Xbox, even TV screens are becoming popular for online video consumption. According to a new study out from NPD surveying 14,000 consumers across 14 countries, some 18% of users are accessing online video on TVs on a daily basis, with some 25% accessing it several times a week, with movies driving much of that growth. Similarly, it noted that tablets and smartphones are also continuing to see more usage for online video. The fact that overall PCs have a higher penetration than tablets may be the reason why PCs — both laptop and desktop — still prove more popular than tablets and smartphones as a place to watch online video. But as we have seen before, when people do have tablets, some are actually spending more time watching video on them than they are PCs, by as much as 30% more. China — urban China, that is — is coming out as the most online-video-friendly country at the moment. As you can see in the table below, which measures online video consumption in different countries by device, China’s urban users beat every other country surveyed, across every device. This may be down to simple user behavior, but it’s also, NPD says, because Chinese users can access a lot more video content online than they can from domestic broadcasters and pay-TV providers. Going back to the bigger picture, the rise in online video watching on TV is not exclusively because people are buying fancier televisions with internet built into them; also playing a role are the consoles that they are attaching to their existing sets. Products like the Xbox or set-top boxes from pay-TV providers that link up with broadband-enabled on-demand services have propelled TV into a strong category for online video, especially in particular markets. In Mexico, some 30% of users watch online video on TVs. Among urban parts of China the number is nearly 40%. Neither still reaches the number of people watching on PCs — 52% on laptops and 73% on desktop PCs, respectively — but it is getting close. “Online content is mostly viewed on computers or mobile devices such as tablets and smart phones, but TVs are increasingly becoming devices of choice for consumers, particularly since an increasing numbers of sets have either built-in connectivity or can be connected to the internet via a peripheral device such as a connected Blu-ray player or set top box, among others,” noted NPD DisplaySearch research director Riddhi Patel in a statement. NPD says films are the most popular online video on TVs, overtaking TV content. But, lest you think the whole world is getting connected, think again. NPD says that 44% of viewers have “no interest” in content on TVs; a further 30% said they do not own the equipment to watch online video. And even if they were given the tools to watch online video on TV, only one-third of those without the possibility to do so now say they would want to. 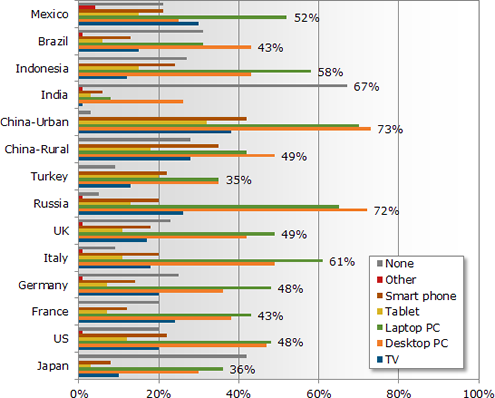 Within individual countries, India ranked the highest among those with “no” online video viewing options, at 67%. But it’s not just an emerging market story: Japan was the second-highest market in the no-online-video game, at 42%.